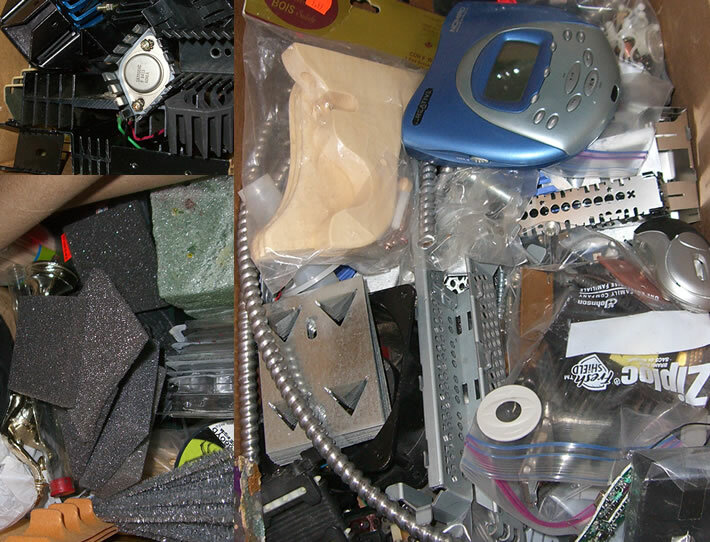 Bits, bitz, spare parts, extras, pieces, to do list, scrap, junk... we have different names for all the extra parts we have laying around. Every time you have some spare parts left over, save them. Whenever you've got pieces you don't feel like or can't use right away, find somewhere to store them. If you see a unique or rare figure you'd like to paint eventually, pick it up. Glance over at something that's on sale and looks useful, then buy it. Whether you're at your favourite local gaming store, a hobby shop, craft or art supply, surplus warehouse or hardware source, you can find items that can be turned into miniatures, vehicles, terrain and everything in between. What they all have in common is you'll end up with a lot of them, and they always come in handy eventually. Buying things as you need them means you miss the sales, but only spend money as you need to. Buying them ahead of time means you might spend extra money on things you don't need right away, but you'll save money in the long term. "Do I have somewhere to store it?" If you don't, you're just ending up with more junk. Boxes like those pictured here or stackable storage containers are essential to keeping an organized hobby area. Plus, if it's not organized, how do you expect to find anything? "Is there an easier way to create this?" I used to have a lot of scrap metal, and eventually threw it out because I realized that when/if I needed it, cardboard or other paper could create it just as easily. You can find storage containers like these at hardware stores (always going on sale) and they're great for keeping all sorts of little things organized. They come with dividers so that drawers can be turned into 2 or 3 sections - if you need more dividers, cut up cereal boxes into small strips. Usually they also have holes on the back if you want to mount them to a wall. As you can see, I have a couple storage containers like this. One large one holds all the bits for various armies and everything is organized. I keep spare bases handy as well for this and that. Who knows when you'll need one, but better to have it on hand than have to go digging through boxes or bags to find the size you want. In another bitz box, I have all sorts of miscellaneous stuff. Surplus stores are a dream come true. You can find TONS of random, strange and CHEAP items. Larger equipment like old printers are another great source for hobby bits. The thing about bitz and bits is, they tend to be cheap. They're small items, they catch your eye and you can afford to buy a handful now and then. Eventually, they add up. You can also find lots of FREE bits. Ask around your local electronics / computer shops (not name brand places, but the mom and pops) for old equipment or grab something from an e-waste drop off and go to town with a screwdriver. I picked up these Dark Angels for stupid cheap at last Games Day and they just came in bags. Rather than awkwardly store them or take the time to remove everything from their sprues, I just chopped up sections of sprue and hid them away in drawers. I've lucked out on bulk deals quite a few times, which works quite well in my favour. This is how I can easily grab minis for series like Back to Basics or give some to friends as test models for their painting exploits. Is it really worth it to keep everything boxed up though? I say nay - get a cardboard box and just dump all those lead, pewter and plastic figures into one giant mess. Sure, it's a pain to sort through when you're looking for something, but be honest with yourself - how often do you need to grab a random model? We're not talking your to-be army, just extras you come across from time to time. Shelves are handy for storing, organizing and hiding stuff, especially some of the larger and heavier things you might come across. If we're talking about things you don't need very often, then there's nothing wrong with tucking a rack behind a door. Part of being organized and clean is perception, so get some of the less used items out of sight. The towers of drawers I spoke about above or the boxes of minis and other junk will fit cleanly away on something like this if you like. Another reason to pick up sales and rare items is because they're not always going to be around. Sales, sure you just end up spending a little more later. Rare items though, you might never see again unless you want to drop a bunch on eBay. Just save them somewhere until it's time to paint / use them. If it's rare, maybe it's something you'd rather hold on to until your skill's improved and you want to do it justice. This doesn't just apply to building minis. Keeping a cardboard box around that you can fill with random scrap can lead to all sorts of interesting terrain or bases. Throwing out a printer? Take it apart first. Because of the mess this makes you definitely want it stored in a box. Also, while digging through it for parts, beware sharp corners. Hey kids, see that big blue/silver thing in the top right? That's my first MP3 player. It's got a hard drive in it. Not a memory card - a hard drive. You can fit a whopping 2gb on it. Nice tips Dave, thanks. I have an idea/request, how 'bout donating some bitz to kids? I know some who are getting hooked but need help building up their forces. I've tried asking local rec. committees for a little help but get some pretty funny looks! Or maybe you would have some suggestions where I should look or how to go about asking around? Thanks, I really enjoy your blog and all the info you post. I've seen what you're trying to do, and I don't mean to be insensitive, but you would need an unrealistic amount of bits to keep a group of kids hobbying for any amount of time. Used figures are a more reasonable area to try for. You also don't have much information on what you're trying to do, who you are, about your group, who exactly you're trying to help, what community group/site you're connected with/play at, etc.. beyond "Please give kids free stuff." which raises some flags. Perhaps proxying with cheaper miniature soldiers and using bottled hobby store acrylics would be a less expensive way to get a large group of kids into the hobby. Surplus stores can also be a source of cheap primer. Kids tend to paint figures very quickly - this is another reason why choosing an expensive hobby might not be the best way to entertain them, as the cost : time ratio is largely unbalanced. This is another reason I suggest starting with cheaper proxied figures instead of Games Workshop brand. Everyone could play marines, so everyone would be used to what's proxying what. Awesome tips, but is that a live 9mm roundin the pic with the computer parts, under the razor guard? Ty. And, heh, no, not live. Assembled but empty.